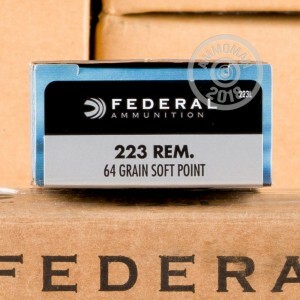 This .223 Remington Federal Power-Shok ammunition is a dependable, affordable choice for shooting small to medium sized game. 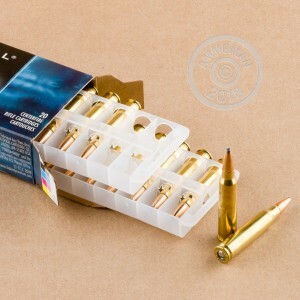 Ideal for AR-15s and bolt-action rifles alike, these cartridges fire a 64 grain soft point bullet at a muzzle velocity of 3,050 feet per second. 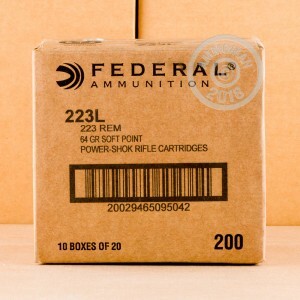 Federal Power-Shok ammo is loaded in Anoka, Minnesota using non-corrosive Boxer primers and brass cases. Power-Shok's soft point bullets are ideal for hunting, as they expand without fragmenting and produce kills while preserving trophies or meat. Order today from AmmoMan.com and get free shipping on all orders over $99.